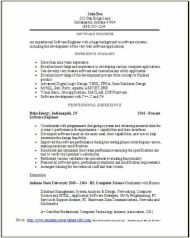 Software Engineer Resumes need to be used like a summary of your experience and your professional skills in the engineering industry. 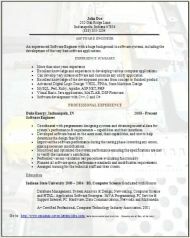 Your new resume for the software engineer position needs to describe all your previous experience in your particular field, including all your achievements. In fact, your experience must match the same skills of the employer's job description. To get the chance for an interview make sure it matches their job duties. Read the employers job description very carefully, then match all the duties you can while creating your own resume. Make this your number one priority to quickly get in for an interview. Software engineers or developers are definitely the creative minds that are the guts of all computer programs. Some will develop many applications that will allow all kinds of people to perform many specific tasks on devices or computers. Others will develop the challenging underlying systems known to actually run each device or possibly control networks. With all the newly created devices as they are now called coming out for public use, software engineers are in great demand. Bookmark our site now- so it's easier to find later. An experienced Software Engineer with a huge background in software systems, including the development of the very best software applications. • More than nine years experience. • Excellent knowledge and experience in developing various computer applications. • Can develop very intense software and customize any utility application. • Excellent knowledge of the development process from concept to finished product. • Coordinated with programmers designing systems and obtaining essential data for system’s performance & requirements – capabilities and their interfaces. • Developed software based on the users need, their capabilities, and cost to help determine the design feasibility. • Improved the software performance during the testing phase correcting any errors, making necessary modifications. • Monitored and optimized the system performance ensuring the specifications are met to verify the customer’s satisfaction. • Performed various validation test procedures evaluating functionality. 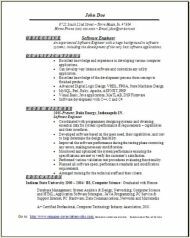 • Planned all software specs, performance standards also any modification requirements. • Arranged training for the technical staff and their clients. Software engineers will usually attain a bachelor’s degree, most often in computer science, possibly software engineering, or any related field would be satisfactory. A degree of mathematics would also be acceptable. Computer science degree programs would be the most common study, due to their nature of covering a very large degree of topics.